First off, let’s be realistic, not all music is good music, so the results may vary for those who have not quite honed your craft. However, if you have the ambition and the know-how, you can take your career to new heights with less effort than you think. For those of you who with raw talent, your music just needs to be heard by as many people as possible, and the rest will be history. 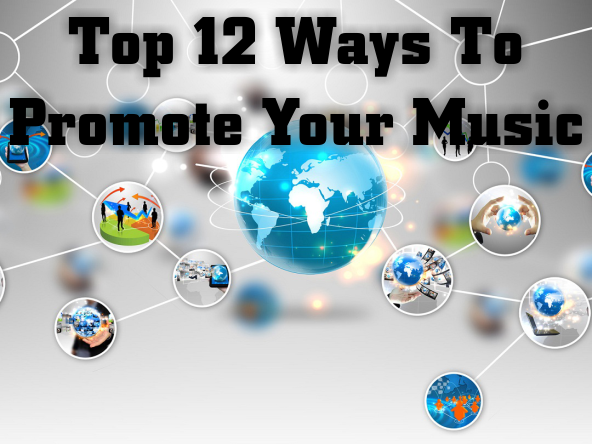 To help you out on your journey of taking over the music industry we’ve compiled a list of what we think are the top 12 ways to promote your music. If you think we’re missing something please feel free to comment below. Enjoy, and good luck! 1. Ask your friends to help promote your songs via social media. We all have those people who say they support us; if that’s the case it’s time for you to initiate a roll call. Find at least ten (10) friends who really support you and ask them to commit to sharing your music on a designated interval. Even with just 7 people you can designate one day of the week for each person to share your music on Facebook or Twitter. That way you have all 7 days of the week covered. If each of those people share your music with someone they actually know there’s a better chance that your music will get heard. There are literally thousands of music blog sites out there, that I’m sure would be more than happy to promote your music in exchange for you promoting their site. Do a Google search of say “indie music blog” click on all the credible links that pop up and find their contact information. If they don’t happen to have a dedicated music submission form make sure you send them an initial email introducing yourself & ask how to get your music on their site. What better place to find music lovers to market your music to than at a concert??? Start contacting the promoters and music venues in your city and find out what you need to do in order to get added to the ticket. In my opinion, if you’re not booked as the headliner you should be asking for nada, except for the opportunity. You’ll have 30+ minutes to put on a killer show and show the 100+ people in the audience why your band deserves their ears. If you’re as good as you think you are, you’ll leave with some new loyal fans who can find all your music via the website on the stickers you gave them or the CD you sold them after the show *hint hint*. For the MC’s and Singers out there, if you’re good then people will surely ask who you are when they hear you on their friend’s new song. It’s FREE promotion! Consider all the mainstream artists you hear all over the radio on other people’s songs, but have yet to release a new project. Doing features is an easy way to stay relevant, as well as grow your fan-base. YouTube is our generation’s A&R. GhostTown, Justin Beiber, Iggy Azzaela, and who knows how many others have and will gain success because of YouTube. Singing a cover to a popular song alone and uploading it to YouTube will likely garnish you one-thousand or more views. If you Rap, find the hottest rapper out right now, memorize the lyrics to one of his most popular songs, Rap it on video and then upload it to YouTube. If you’ve never done it before, you cannot say, “It doesn’t work” or that it doesn’t achieve what you’re trying to accomplish. If you’re ambitious enough to try it out, please don’t make the mistake of forgetting to add links to your personal music and social media pages in the video description. You’re in the music business right? Unfortunately a Facebook page is Not your website. Facebook IS a website but it is not your website (it’s Zuckerberg’s). So find a cool domain name like www.MeganBurtt.com and turn it into something you’re proud of. Not to mention, when someone Googles your band name, your website will usually be at the top of the list. Twitter is a very powerful tool for any musician. When you can grasp the concept that almost everyone and anyone in the world is just a tweet away, you’ll understand the true power of Twitter. Don’t make the mistake that so many rookie artists make of tweeting random people links to their music. How annoying is that? Instead use Twitter to make friends. People like conversation, but more importantly people like ATTENTION. So give people what they want, and they’ll give you what you want – their Attention right? I’m sure you’ve been watching your favorite TV show and just so happen to notice that awesome song playing in the background, right? Well, if it wasn’t for that band’s music publisher you might have never heard it. Music publishers make money only when you make money so they have every reason to promote your music to the fullest extent and utilize every connection they have to get it featured in a TV show, Commercial, or Video Game. In case you’re wondering how music publishing works, check out our Q&A with Denver based music publishing company Lyric House. Now who doesn’t love free S$%t?? For a giveaway you can utilize Facebook or Twitter and post a photo or a song. Let people know that you’ll be selecting one of the people who share it to win a T-shirt, signed copy of your album, a free ticket to your show, or whatever else you can think of. There’s multiple ways to conduct a giveaway, and some will garner better results than others, so get creative. If there’s anything you can think of or that you know works please leave it in the comments section below! !